The family owned Zeni Winery is situated close to Lake Garda, above the picturesque town of Bardolino. The winery was established in 1870 with Fausto, Elena and Federica running the business following in their father Gaetano ‘Nino’ Zeni's footsteps. As well as managing 25 hectares of their own vineyards the family source grapes from around the region to make their wines. The vinegrowing land of Bardolino extends from the eastern shore of Lake Garda to the morainic hills of the hinterland where the landscape is dominated by vineyards and olive groves. The origin of this stretch of land dates back to the Rissian and Wurmian glaciation, when the retreat of the Atesino Glacier formed a morenic amphitheatre. The pebbly and silty sediments deposited afterwards enriched the soil and made it light, deep and capable of heating up rapidly even during wintertime, thus assuring ideal conditions for growing of grapes. In addition the thermal regulating effect of the nearby Lake Garda guarantees a rather mild climate, with average annual temperatures of around 12-13 C° and average relative humidity around 70%. In wintertime temperatures generally drop to 2-3 C° in January (this is why snowfalls are rather rare in this area) whereas summer temperatures seldom rise above 22-23 C° in July. The area where Bardolino wine is produced, once limited to the fields surrounding the town this wine takes its name from, extends today into the adjacent areas including altogether fifteen municipalities. The vineyards given over to the production of our Bardolino DOC Classico, Bardolino DOCG Classico Superiore and Bardolino Chiaretto Classico stretch across the slopes of the hills along the shore of Lake Garda, exactly where the Classico area, the most ancient portion of the wine region, is located. The Corvina grape provides body and colour to the wine, whereas Rondinella is responsible for its typical, herbal and savoury character; the Molinara grape gives the wine fragrance and freshness. This was a delicious Amarone with a rich, fully bodied style. The grapes are air dried through a process called “appassimento”, which causes them to shrivel and concentrate the flavours. There was a strong nose with plum and jam, followed by a smooth fruity palate with spice and tobacco notes. A very nice example of one of my favourite wine styles. In 1824 Nicolò Tedeschi entered into a deed of purchase of some vineyards, followed by Lorenzo Tedeschi , affectionately nicknamed "carboy" because it was always busy transporting carts filled with wine. 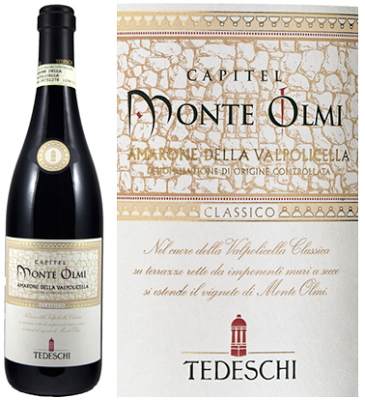 Riccardo Tedeschi, considered by the inhabitants of Pedemonte as a true patriarch, had the foresight to buy in 1918 the vineyards of Monte Fontana and Monte Olmi. Valpolicella is a very broad area of about 5800 hectares delineated on the north by mountains Lessini, south of the plain of Verona, east of the Soave area and to the west by the Adige river. The area is then divided into three areas: the Classical (northwest of Verona), the Valpantena (a narrow strip of vineyards north of Verona) and Valpolicella East (east of Verona, overlapping in part to the DOC Soave). The Tedeschi vineyards are partly in the classical and partly in the east. The Valpolicella includes the 3 valleys of Negrar, Marano and Fumane, with the municipalities of Fumane, Marano, Negrar, St. Peter Incariano and Sant'Ambrogio di Valpolicella. From the three main valleys they obtain wines with different characteristics. The vally offers elegant wines with great structure and rich in salt, harmonics. The valley of Marano gives high quality wines in hot years, being the vineyards at an altitude of 400 meters above sea level for elegant wines with intense flavor. Finally, the Fumane valley produces wines with slight residual sugar, soft, while the area to the south (where the valley meets the villages of St. Ambrose and Gargagnago) gives very typical wines, with low acidity, but with excellent structure and long duration. The vineyards of the classic zone (between ownership and rent about 20 hectares) are partly in Pedemonte and partly in the municipalities of Saint Ambrose and Fumane.A Pedemonte there is the vineyard Monte Olmi, a renowned cru, which extends for about 2.5 hectares, developed on terraces. As regards the land east of Verona there are Squaranto, the Mezzane Valley and the Val d'Illasi. Here there is an alternation of hills and steep gorges, the result of prehistoric volcanic eruptions. The soil is rich in marine fossils, especially in the area of Illasi. The municipalities in this area are Verona, San Martino Buon Albergo, Mezzane di Sotto, Colognola ai Colli, Illasi and Tregnago. 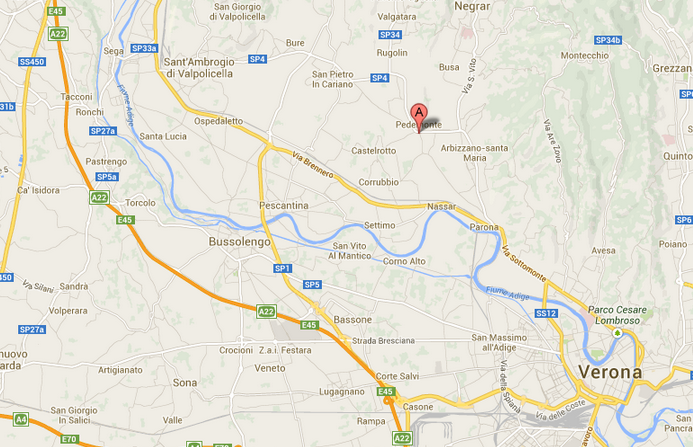 The company recently purchased 84 acres of land, the new Maternigo property, located within the area DOC Valpolicella, between the towns of Tregnago and Mezzane di Sotto. The purchase is the result of a long and careful research conducted by a team of agronomists and geologists called Germans by the brothers to study the terrain devoted to the production of high quality wines. Amarone della Valpolicella, now widely regarded as the most precious of Veronese wines and as is one of the most important Italian reds. Based on the evolution of Recioto wine. In the fourth century AD, Cassiodorus, minister of Theodoric, king of the Visigoths, in a letter describing a wine made with a special technique of drying the grapes, then called Acinatico produced in that area known as Valpolicella (according to some name that derives from the Latin "Vallis-polis-cellae" and could mean "Valleys of many cellars"). The Acinatico is undoubtedly the ancestor of Recioto and Amarone. For a time Valpolicella produced only Recioto, but with the passage of time and the changing of the seasons, the grapes, although prepared in the same manner, gave a wine considerably drier than the original . Thus was born, taking its name from its characteristic bitter vein, Amarone, whose first bottles began to be produced only in the early years of the twentieth century for family or friends. However, in 1968 came the recognition of the Designation of Origin (PDO). The Amarone della Valpolicella wine is a product that requires very high quality grapes and a meticulous attention to craft. For the production of Amarone and Recioto della Valpolicella a winemaker is expected to set aside a quantity of grapes does not exceed 70% of the maximum permissible that the specification limited to 120 quintals per hectare. Even more today than in the past, the grapes are carefully selected in the vineyard and once harvested arranged with care in a single layer, to better circulate the air and prevent the grapes from being squashed it in plastic and placed in a large fruttaio completed recently, equipped with a control of temperature and humidity in order to ensure optimum conservation of the bunches. Humidity control is necessary since the wrong conditions can create damage to the grapes, and compromise their health. The air conditioning system operates at temperatures similar to those found in traditional processes From the time of Cassiodorus the method of production was virtually unchanged: generally the grapes (less than a seasonal pattern completely unique and unpredictable) are collected from the third week of September and the first week of October, which pays special attention to the grapes are perfectly healthy and come to full maturity, so that they can successfully deal with the delicate phase of drying. For three - four months the grapes are constantly monitored, turning the grapes to remove promptly any grapes affected by rot and mold until you lose at least half of their weight and with the evaporation of water to reach the desired concentration of sugars in the extent of 25-30%. In this particular - and delicate - phase in the grapes takes place a series of complex transformations, the reduction in acidity to the change of the relationship between glucose and fructose, which favor the concentration of polyphenols and significantly increase of glycerin and other substances that make the wine that is obtained by completely different from any other obtained from normal vinification of grapes fresh. At this stage, another special substance, called Resveratrol, is produced which is said to to keep the arteries clean and reducing the risk of 'atherosclerosis and heart attack. After further drying the grapes are subjected to crushing, which generally coincides with the coldest period of the year. A traditional method of vinification is used at natural low temperatures, since it takes place during January and February) and there is a long period of contact with the skins that can last for a few months. The wine is then aged in in oak casks of a capacity ranging from 1,000 to 5,000 liters and immediately after the period in the barrel, there is a further period of bottle aging in the cellars of production, prior to sale. A beautiful example of a classic Amarone Della Valpolicella. Rich and deep coloured, smokiness, figs, cherries. The intensity of flavours was incredible. I would love to try again.